DETROIT, Michigan – Recently, Ford introduced to us to the Mustang Bullitt as a 50-year anniversary homage to the 1968 Bullitt movie starring Steve McQueen. Bullitt was the Blue Oval's answer to those looking for on-road excitement and attainable nostalgia. 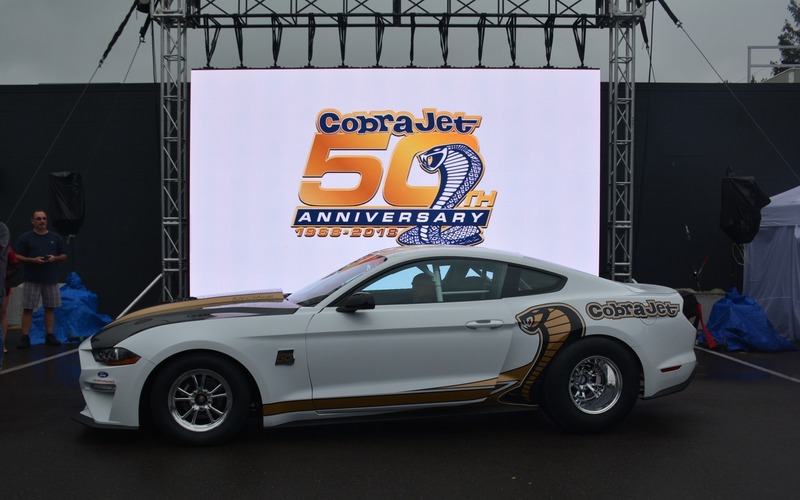 Now, in a similar fashion at a media-only function along Woodward Avenue, one of the sites for the 16-mile (26-km) Woodward Dream Cruise, it has revealed another 50-year anniversary, limited-edition gem for those drag-strip lovers: the Mustang Cobra Jet. At a cost of USD$130,000, only 68 Cobra Jets will be produced paying tribute to the 428-cid drag racing star that took centre stage at the NHRA Winternationals in 1968. Four Cobra Jets participated in that season-opening race, won by Al Joniec at what's now known as Auto Club Raceway Pomona. Back in '68, Joniec posted an impressive 11.49 over 120 mph (193 km/h), but naturally, that's nothing compared to this new model shining in Oxford White (also available in Race Red) featuring anniversary-badged racing wheels. According to Ford, the 50th anniversary product—now on order—will eclipse previous records by reaching 150 mph (241 km/h) with a quarter-mile run in the mid-eight-second range. The Cobra Jet is only available for the drag strip with FIA-certified seats and a full NHRA-certified safety roll cage, but when its 5.2-litre V8 engine was started, it let out a roar from its open exhaust for all on Woodward Ave. to hear. That extra grunt is aided by a 3.0-litre Whipple supercharger that, along with the V8, sends its power through a nine-inch solid rear axle, two-way coil-over shocks that can have its ride height adjusted, a low-drag disc brake system and a four-link rear suspension with anti-roll and panhard bars. The Cobra Jet already had one rebirth in 2008, but this latest incarnation and fast quarter-mile time plans to make a big statement during the Woodward Dream Cruise along with its 1000-plus other Mustangs gathered at Mustang Alley, and well beyond. The Cobra Jet made a roaring splash, but Ford had more strategic company news to share. The Ford brand announced that's its already started the process of shifting globally from nine platforms to five flexible architectures starting with the new front-wheel-drive Ford Focus, now available in Europe and soon-to-come to China. They plan to roll out the other four (rear-wheel drive, commercial, body-on-frame and battery electric) as the vehicles come new to market. “We are making strategic choices on how to play and win with solutions that are efficient in various ways,” explains Hau Thai Tang, executive vice-president, Product Development and Purchasing, Ford Motor Company. For Ford, it's all about maximizing market share beyond price through investment engineering, quality and scale. Its future vehicles will essentially deliver more for less with a high-level of commonality as well as upper body and suspension differentiation. We will have to wait and see if that's the strategic ticket to separate Ford from the rest in an automotive future that's truly up in the air.